After Judy Dyble left Fairport Convention in May 1968, it was her replacement Sandy Denny who picked up critical kudos as the ensuing years unfolded. Dyble, though, did not drop off the face of the earth and, if credits were looked at closely enough and margins examined, it was evident she had a career in music as fascinating and often as admirable as that of Denny’s. Widespread consideration of her role in British folk and folk rock began after the issue of her album Enchanted Garden in 2004. Before that, Dyble’s last commercial release was in 1970. The reissue of 1970’s Morning Way, her sole album as part of the duo Trader Horne, and the release Anthology: Part One sets Dyble in a context she has never had before. Anthology: Part One (previously available as the first disc of the three-CD set Gathering The Threads - Fifty Years of Stuff: it was the set’s only essential disc) takes the story from 1964 to 1982, while Morning Way amply illustrates where she had arrived as the Sixties ended. Anthology: Part One and Morning Way are issued on both vinyl and CD. Judy and the Folkmen begin the story on Anthology: Part One. It’s late 1964 and Dyble is 16. The quartet had formed in north London’s Muswell Hill and were far removed from the district’s other great musical offspring of the period, The Kinks. The two home-recorded tracks on Anthology: Part One(pictured right) are polite and could be by any early Sixties middle-class folk-inclined group. The sole stand-out element is Dyble’s clipped, keening voice. Much more interesting is a lengthy concrête-style improvisation also from 1964, recorded with future fellow Fairport Convention member Richard Thompson. It bears no relation to folk music or, for that matter, popular music. Fairport Convention themselves are represented by two tracks from their first recording session of 1967: a fine, rounded, rolling version of “Both Sides Now” and the fantastic, yearning, almost psychedelic folk rocker “One Sure Thing”: the latter demonstrating that Dyble had found her own voice. Albeit deeper, more sonorous and less tremulous, she sounds like an Anglicised Joan Baez. Then, in 1968, for Fairport Convention it was Dyble out and Denny in. Dyble quickly hooked up with the eccentric and jazzy pre-King Crimson trio Giles, Giles and Fripp. Of their four tracks collected for Anthology: Part One, “Passages of Time” is the stand-out. A minor-key drama, it brings a dramatic setting where Dyble easily ascends through a melody which begs a grand, Moody Blues-style arrangement. Giles, Giles and Fripp became a stopping-off point, as King Crimson beckoned for Robert Fripp and Michal Giles. Through a flatmate, Dyble met Jackie McAuley, an ex-member of Van Morrison’s former band Them. Together, they formed Trader Horne. The sole Trader Horne albumMorning Way is generally categorised as psychedelic or acid folk. Both imply something that it is not. Despite a preoccupation with then-voguish mythological literature, it is – the jazzy “Down and Out Blues” excepted – ambitious folk-inclined pop with baroque leanings, and closer to the slightly florid early Roy Harperthan the Incredible String Band or anything solely springing from the traditional. This is a very direct album. Indeed, what brings Morning Way its edge is Dyble and McAuley’s way with a melody. If they had not stalled after the album, which barely sold, it is easy to imagine them progressing to compose and record something as epic as Lindisfarne’s 1970-recorded “Lady Eleanor”. But it did not happen. Trader Horne broke up in summer 1970. Dyble never recovered the momentum which had propelled her up to their album’s release and, for the ensuing period, Anthology: Part One chronicles her subsequent path via a series of one-off guest appearances and demos. Judy Dyble was and is blessed. How many artists have two truly great albums under their belt? She does, with the eponymous debut Fairport Convention album and Trader Horne’s Morning Way. Anthology: Part One is valuable as it rounds the picture out. She is recording and performing again. Trader Horne are back in business. After taking in these reissues, it’s impossible not to wish that Judy Dyble hadn’t spent three decades as an almost-undetectable musical presence. What could she have done if Trader Horne had not disbanded? Imponderables aside, it’s good to have her back. Carrying-on from the recent Earth reissue of 1970’s Morning Way,her sole album as one-half of Trader Horne, Judy Dyble’s wider body of work now gets a re-distillation as a three-part Anthologyseries. Although in itself a refashioning of the extremely limited self-released Gathering The Threads (Fifty Years Of Stuff) boxset from earlier in 2015, the more widely available Earth reincarnating should mean that Dyble’s creativity within and without Fairport Convention should finally gain the recognition it deserves. This beautifully designed first volume – documenting Dyble’s early activities between 1964 and 1982 – will certainly be hard to top for sheer allure, range, warmth and consistency. Sequenced in helpful chronologically order, Anthology: Part One traces the arc of Dyble’s formative times as a solo artist and as a keen team-player through key discography extracts, rarities and previously unreleased demos. This means we can plot Dyble’s heartening career as a Joan Baez/Peggy Seeger-inspired folk chanteuse (with two primitively home-taped 1964 tracks as Judy & The Folkmen), a psych-rock siren (with two unreleased 1967 cuts vocally leading Fairport Convention, the highlight being a sublime take on Joni Mitchell’s “Both Sides Now”), an adaptable female vocal foil for the free-wheeling explorations of Giles, Giles & Fripp (across four ear-opening tracks gathered here that veer from jazz-pop and raga-rock to pastoral exotica and lysergic murder balladry), a harmony-coating accomplice for the lesser-known wares of G.P. Fitzgerald (with one cut from 1970’s Mouseproof album) and a blooming solo songstress (across four lush rare recordings from 1972, 1973 and 1974 and on a curiously lo-tech synth-led 1982 cover of Pink Floyd’s “See Emily Play”). Naturally, not quite everything is a top-drawer selection – with some 1964 musique concrete-like instrumental doodling with then beau Richard Thompson (the too-long “Improvisation”) and a peculiar cassette tape-demonstration advertising piece (the bizarre Bob Harris-featuring “Mirror Master”) perhaps only included for historical value – but overall Anthology: Part One is a remarkable redress for Judy Dyble’s misplaced position in music historical and a delightfully well-rounded listen in its own right. Probably one of the most underrated female singers of the sixties folk movement, Judy Dyble has been enjoying quite a resurgence in the past few years. Louder Than War’s Craig Chaligne reviews the recently released first part of her anthology. After being unceremoniously dumped by Fairport Convention in in May 1968 Judy joined “Giles, Giles and Fripp” just after the release of their “The Cheerful Insanity” LP with her then boyfriend Ian Mcdonald. Her tenure with the band was short but her next project Trader Horne where the shared the limelight with ex-Them guitar player Jackie McAuley proved more fulfilling for her artistically. They only recorded one album but what an album it turned out to be, “Morning Way” has become a classic and has also been recently released by Earth Recordings. Unfortunately the Trader Horne affair ended up abruptly (check Judy’s excellent biography section on her website for further info) and after one last attempt at being in a band, Judy gave up music to settle in Northamptonshire with her husband Simon where she started working as a librarian and helped out in her husband’s tape copy business. The first volume of this anthology concentrates on recordings from the bands and solo projects Judy was involved in between 1964 and 1982. The record starts off with a trio of home tape recordings from 1964, the first two feature Judy’s first band The Folkmen. “Come All You Fair and Tender Ladies” is an american folk song that was covered by about just every folk singer in the sixties as was the second number “Spanish is the Loving Tongue”. The third track features a wild improvisation featuring none other than Richard Thompson on guitar and Judy on recorder, a twelve minutes free form extravaganza, quite an avant-garde piece for 1964. We then jump three years in time to 1967 with two Fairport Convention Demo’s. First is an excellent cover of Judi Mitchell’s “Both Sides Now” where Judy’s voice works wonders, the other song “One Sure Thing” appeared in a similar arrangement on Fairport Convention’s first album. Next are four tracks from the Giles, Giles and Fripp period. The recordings known as the “Brondesbury Tapes” were done at the band’s own flat in Kilburn. These songs are simply excellent particularly the first number “Make It Today” with its breezy clarinet intro and displays a feel similar to Burt Bacharach’s “Do You Know The Way To San Jose”. The disturbing “Murder” with its choir like chants of “Murder, Murder, Murder”, flute an guitar interplays and martial drums could almost be an anti-militaristic song. Of great interest are an excellent duo of solo demos from 1973 where Judy is at her absolute best vocally. “Better Side Of Me” with its subtle orchestral touches and “I Hear a Song” really make you wonder what could have happened if Judy had put out a full solo record round these years. A 1982 cover version of Pink Floyd’s “See Emily Play” would have a been a definite hit if had ever been released. 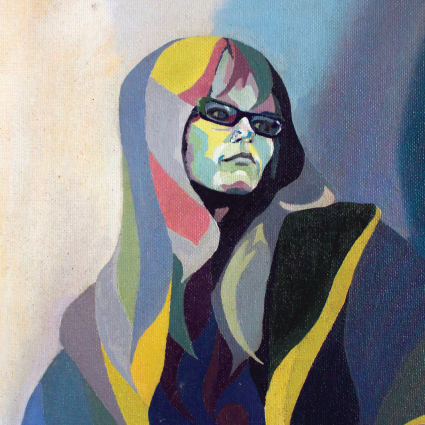 Judy Dyble has been described by sections of the British press as a ‘national treasure’, a moniker of pride often assigned with the benefit of hindsight, or after an artist’s worth is calculated in a more mainstream context. Whichever way, Judy Dyble’s musical accomplishments deserve praise from the establishment. Dyble preceded Sandy Denny as singer with Fairport Convention, and was a founding member of Trader Horne. Those expecting an anthology of her work to focus on traditional folk leanings might be surprised that Dyble’s influences extended beyond a homespun cultural sound. Collaborations with the likes of Robert Fripp and a young Richard Thompson show an experimental edge, making comparisons with the likes of the Norwegian, Karin Krog not that preposterous, even though Dyble’s voice is idiomatically suited to traditional form. On the track ‘Improvisation’ she performs with Thompson at the age of 17 yrs old, the music awkwardly veering from inharmonious jazz experimentation gamelan-style to folk woodwind mayhem in a manner not exactly coherent. When this is followed on Anthology Part 1 by Dyble’s upbeat take on Joni Mitchell’s ‘Both Sides Now’ the incongruity of the track sequencing does call for some dramatic refocusing of perceptions. ‘Both Sides Now’ and ‘One Sure Thing’ are Fairpoint Convention demo recordings, which should be obvious but it isn’t. I can only assume they’re alternate takes. The sound is fervidly embroidered in the way of Trembling Bells’ progressive folk, and fans of the latter will find much to enjoy in Dyble’s early career as singer with Fairport. Tracks 6-9 are from the 1968 group Giles, Giles and Fripp which later devolved into King Crimson, and show a more progressive edge especially under a jazz banner. 'Under The Sky’ is an evocative track, very much of its time, Robert Fripp’s guitar is beautifully elevated in mood and the sound is still kindred with the summer of love. The silvery modulations of Dyble’s voice soar to high-pitched but never shrill top ends, and she appears to achieve each musical phrase with skilful ease. It’s a portentous instrument, one that defines a sound rather than augments it for the most part. Baroque number ‘Better Side of Me’ comes more from the Bacharach school of pop, and I detected a slight warbling as Dyble attempts to control her estimable top end in a song appearing to call for huskier tones. Having shared the stage with the like of Hendrix and Syd Barrett-era Pink Floyd, Dyble was no doubt a debutante of the emergent progressive and psychedelic sounds of the late 1960s. Here on Anthology Part 1 you’ll find a high spirited and cheerful cover of ‘See Emily Play’, less acid dream and more innocent recollection. Evidently, she would occasionally sit on stage and knit while the principal band was playing. Weird but somehow apt for a period of holistic change. Perhaps as a reminder of how we like to exploit our national treasures, included here is an advertisement that Dyble did for a cassette tape product “The Mirror Master” in 1982. She sings the hymn ‘Amazing Grace’, its message of christian redemption connaturalized by lyrical changes spelling out the virtues of the chrome cassette. All with marvellously wooden male voice-over by husband Simon Stable. Truly surreal. Judy Dyble could hardly be described as a major success, but she has had a colourful career. The first female singer in Fairport Convention, she was replaced by the brilliant Sandy Denny, but went on to work with Robert Fripp and others, before disappearing from the music scene and then making a comeback. She is currently involved in a nostalgia blitz that includes this intriguing but curious set, available on vinyl and covering the period 1964-82. There’s a chaotic, clattering improvisation recorded with her then boyfriend Richard Thompson in 1966, a couple of unreleased early Fairport demos, including a well-sung treatment of Judy Collins’ Both Sides Now, and swirling psychedelic ballads recorded with Giles, Giles and Fripp, before Fripp became famous with King Crimson. Finally, there’s a 1982 advert for a cassette company, in which Amazing Grace becomes Amazing Tape, and Bob Harris supplies the whispered voiceover. Hilarious. There are artists that fate places, on time, in the first box of the great board game fame and success, and then, ironically, deviate in other directions, armed only with his talent and the determination to create, with the great burden to put aside regrets and missed opportunities.The English singer and author Judy Dyble could be the perfect stereotype for this category. In 1964, still of school age, he founded his first band, Judy and The Folkmen , putting the prodigious vocal talents to the service of a crystalline acoustic folk. Then, through his friendship with Richard Thompson , Ashley Hutchings and Simon Nicol , she becomes the first singer of Fairport Convention , sharing the first steps of the main adventure of folk rock English, performing the UFO club, the heart of the nascent British underground scene, in Sept. shared with Pink Floyd in its infancy, and recorded the vocal tracks of the band's first self-titled album of Thompson , before a separation that will herald the entrance in Fairport 's Sandy Danny . A couple of years later, we are in 1968, thanks to the response to an ad in the magazine Melody Maker, comes in contact with Ian McDonald , and soon the company is enriched by the presence of brothers Mike and Peter Gilesfresh registration an album with Robert Fripp . Judy took part in several studio sessions, which will take the name of Brondesbury Tapesadds doses of folk in the strange blend of rock and jazz that still is not called progressive , and then again changes road. Part of those tapes will be published in the anthology of King Crimson , " The Young Person's Guide To King Crimson ' ", born from the roots of Giles, Giles and Fripp when Pete Sinfield took over the role of lyricist toJudy Dyble . The story of the singer, after another short adventure in Key acid folkwith former Them Jackie McAuley under the name Home Trader and an attempt prog jazz in the company of Lol Coxhill , Steve and Phil Miller of the Caravan ( Dyble, Coxill & the MBs ) becomes, by the early '70s, the story of a normal life, outside the art circuit and with the joys and pains of a librarian with family. Then, in the late '90s, the invitation to one of the periodic celebrations of the members of Fairport Convention , the initial trouble getting back on stage, and finally the "homecoming", thirty years later, among the harmonies folk of old comrades. And the start of a new stage musical, built by mixing old passions in contemporary sounds, through a dozen solo releases, from 2004 to today.
" Judy Dyble Anthology: V ol. 1 "tells the story in summary form from the beginning until the early 80s, and is the first part of a triptych intended to celebrate the original history of this Joni Mitchell Albion.There are the beginnings unripe, documented from home recordings of 1964, a long contemporary improvisation with Richard Thompson that is valid as a climate free of those years, a wonderful " Both Sides Now"with Fairport full and the complete Brondesbury Tapes in which you listen to the guitar of Fripp throw seeds for the future advent of the crimson king. A psychedelic " See Emily Play "by Syd Barrett in 1982 is the most recent legacy of this first part of the work anthology. But, above all, there are two songs, " Better Side Of Me " and " I Hear A Song ", recorded between 1972 and 1973, making explicit what goals could reach Judy , if fate had decided to advance it some box. Judy Dyble is a remarkable and somewhat restless figure who emerged from the British folk rock scene in the late 1960s. She was an early member of Fairport Convention, sang with the Incredible String Band, the proto King Crimson act Giles, Giles Fripp. She was also part of the underappreciated Trader Horne and earlier this year the disparate strands of her career were brought together in the impressive anthology Gathering the Threads (Five Years of Stuff), the first of those three discs is extracted to create this memorable and revealing volume. The treasure digs go deep and so the collection opens with a 1964 home recording of “Come All Ye Fair and Tender Ladies”, a performance that’s enhanced greatly by the lo-fi quality of the recording. Dyble’s voice is unaffected and deeply moving, something it would remain through the years to come and across the songs that follow, whether a pretty faithful take on Joni Mitchell’s “Both Sides Now” or an effective reimagining of Pink Floyd’s “See Emily Play”, a song that has often sounded best when performed by female vocalists. In between there’s the eerie folk rock of “One Sure Thing”, which is sad, desperate and positively cathartic. We’re also witness to the jazzy “Make It Today”, and the country “I Hear a Song”. A number of these are previously unreleased gems and their unretouched qualities don’t so much date them as make it possible for them to become all the more endearing, not unlike the commercial for the Mirror Master tapes which closes out this disc. This first anthology comes with an impressive 20-page booklet featuring images and words and memories of a time long gone. And, of course, so much of what you’d want to hear from a singer who was there and will always be here. Dyble will no doubt garner comparisons to other vocalists who emerged during the same time, including Vashti Bunyan, and no doubt there are similarities. But she’s very much her own woman, given to her own whims and vision in a career that was initially far too shore. She left the industry circa 1974 after sharing the stage with the likes of Pink Floyd, Yes, and others. She lead a quiet life until roughly 20 years later when she began taking to the stage again. By then widowed she began to slowly return to recording and has since released a number of unique platters that have often held up nicely beside her classic work. There have been various archival recordings that have spotlighted her time with Fairport and others and she’s even performed with her former band a number of times since her reemergence. This year has seen a relative flurry of activity including this anthology and now its three separate episodes. She’s also been reunited with former Trader Horne partner Jackie McAuley for their first shows since the early 1970s and their incredible 1970 album,Morning Way is also finding its way back onto the market. As much a vocalist of her times as a vocalist of any time Judy Dyble remains a figure worth our attention, a singer who could move comfortably between folk, rock and progressive music without pausing to measure the difference. This first volume of material extracted from Gathering the Threads will leave you wanting more and no doubt the coming year will see an increase in her profile as more (re)discover her.